I started to learn Ruby on Rails in 2006, when I was still a full time .NET developer. At that time many ASP.NET and C# projects had began to implement features borrowed from Rails, since I had some Ruby experience back in 2003 I asked myself: why not try Rails. So I just dit it and never regret. It’s great one only needs to read two books to learn an amazing web framework, right? And it’s even greater as I had already read Programming Ruby before! So I bought Agile Web Development with Rails and started my journey, along which I learned that you have to master a lot of related technologies to keep yourself not off rails. I also realized I needed to buy TextMate (the author claimed we could get free upgrade to 2.0, maybe after Leopard’s release I guessed ATM) and a MacBook Pro to kiss Windows goodbye. Today, Rails is approaching 3.1 and every rubyist know 3.1 is big and the evolution of Rails during the last couple of years is huge. The learning curve for beginners hasn’t changed as the related technologies have updated much just as Rails itself ☃. Is two books still enough to learn Ruby on Rails now? I bought new editions of Programming Ruby and Agile Web Development with Rails. They are still two of a few books that one should not miss. 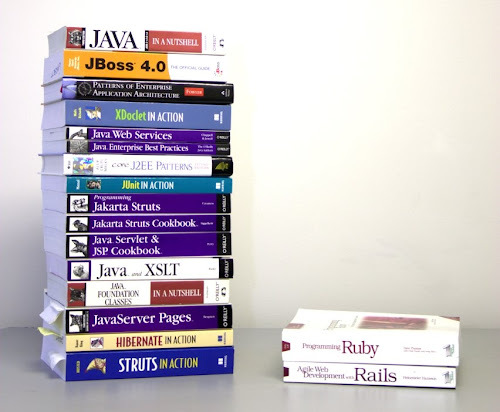 But I’m pretty sure we have too many books to read - there are more than 25 Ruby books on The Pragmatic Bookshelf, I have read most of these books from Pragmatic just because they offer discount from time to time <3. Rails 3 Way - where there was Rails Way, there is Rails 3 Way. Metaprogramming Ruby: Program Like the Ruby Pros - this one is actually on pure Ruby but it shows you many magics the Rails framework uses. Crafting Rails Applications: Expert Practices for Everyday Rails Development - oh this might a little bit difficult for beginners but the book was so good written in depth. I’m not talking that other books are not good. Many are just outdated if you want something covering Rails 3. I read all the above books I know they let you know Ruby 1.9 and Rails 3 better. There are tons of free resources to arm you with Rails 3 too. I recommend this free Rails 3 tutorial to everyone: Ruby on Rails Tutorial: Learn Rails by Example by Michael Hartl. It teaches you step by step how to program in Rails 3. You will learn TDD and you might be able to create another twitter when you follow this awesome Rails 3 tutorial to the end! And don’t forget we have RailsCasts, RubyFlow, Ruby5, just to name a few.